Although the eventual inclusion of cellular data connectivity for Surface seems likely, Bloomberg reports that sources familiar with the matter are saying consumers will see Wi-Fi-only tablets at launch. The problem seems to be due to a lack of specification standards, according to those same industry insiders. Will this hurt Surface? Some tech enthusiasts don't think so. But, you have to admit a lack of any features look pretty bad for such a potentially expensive tablet. Which brings me to the next point: industry sources are also claiming that Microsoft's Surface will debut at two distinct price points: $599 and $999. The least expensive model, the $599 "Surface for Windows RT", is expected to feature a Tegra 3 and Windows RT. Windows RT is a stripped-down, ARM-based version of Windows 8 aimed at tablets. A higher-performance, Intel-based version is expected to run about $799. At $999, "Surface for Windows 8 Pro" will stuff an Ivy Bridge processor into a package that is slightly thicker than it's cheaper brethren, but aims to offer users a full-fledged PC experience. 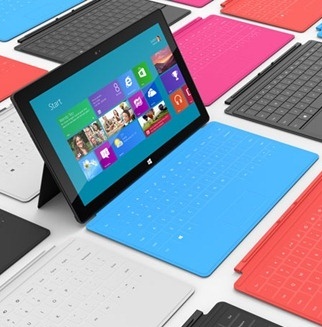 However, with these prices, Surface might be a tough sell against well-proven tablets, devices and manufacturers which are already entrenched in the mainstream market. The Retina screen-sporting iPad 3 sells for less than $500, not to mention a myriad of great Android tablets under $400. Also, at a thousand bucks, the Windows 8 Pro model falls into Macbook Air territory -- another potentially tough (but not impossible) sell for Microsoft. This high-end model seems geared to compete against Ultrabooks, but many of those are already substantially cheaper with prices hovering around $699-$799. Wondering when Surface will launch? So is everyone else. At the event where Microsoft debuted the tablet, the company stated that the Windows 8 Pro model would ship about three months after the Windows RT version. Sure, Surface is on the pricey side, but Microsoft has managed to create an extraordinary amount of positive buzz surrounding the tablet. The company may have something special on its hands, but ultimately, we'll just have to wait and see.